In September 1939, the development of the first wholly new tank design of World War 2 was commenced. The General Staff drew up an outline specification for a new super heavy infantry tank, the A20. This was intended to fulfil a World War 1 style infantry support role and had to be able to cross the wide trenches that were expected between the Maginot and Siegfried Lines. The specification called for a maximum speed of between 5mph over heavily shelled terrain and 9mph everywhere else. It had to be able to cross 16 foot wide trenches and climb 7 foot high obstacles. The new tank had to be able to resist hits from 37mm and 47mm anti-tank rounds, it had to have a crew of 8 and be armed with a field gun in the front hull, a 2 pounder and 7.62mm BESA mg in each side sponson, 2 further BESA mgs to give all round fire and 4 2 inch smoke mortars. This initial specification resembled a cross between the Mk VIII International from 1918 and the eventual A22 Churchill. The design was refined and 2 different tanks were the result. The first was the 80 ton TOG Super Heavy Tank, which proved to be unworkable, the second was the 41 ton A22. The new specification for the A22 was quickly approved and a mock-up was produced by November 1940. In December of the same year, a pilot model had been produced and was undergoing trials. In March 1941 the first production model was built from mild steel and was running. The A22 was built by Vauxhall Motors and was powered by their Bedford Twin Six 350hp engine, giving the tank a top speed of between 15 and 17mph. They were ordered to build between 500 and 600 tanks by the Spring of 1941. Early in the Summer of 1941 the new tank was officially named the Churchill, after Britain’s wartime Prime Minister. The Army started to take delivery in July 1941. 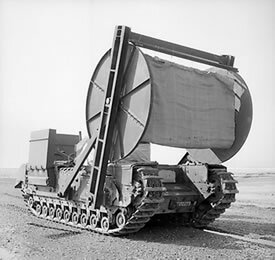 The early tanks were plagued by mechanical problems; it took a year to sort these problems out. However, once these problems were finally sorted out, the Churchill went on to become Britain’s most important tank, due mainly to its incredible versatility. It is this versatility that has given rise to many historians claiming that the Churchill was in fact, the Allies best tank of the war. 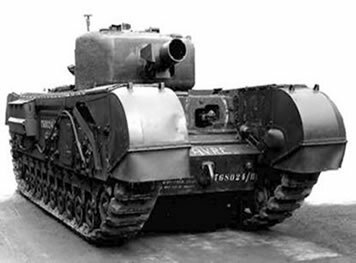 Although the Churchill was slow and heavy, it had excellent mobility as it could cross virtually any type of terrain and was especially good at climbing hills. The Churchill first saw action during the ill-fated Dieppe Raid of August 1942. The raid was a disaster; the Churchill tanks that landed on the beach couldn’t climb the steep shingle or beach front walls and were either knocked out or abandoned. After being upgraded, they later saw action in the Middle East and 6 were used during the 2nd Battle of El-Alamein where they were found to be immune to enemy anti-tank fire! They also went on to serve with distinction in Tunisia, being perfectly suited to the hilly terrain. The Churchill saw service throughout the rest of the war, in both the Italian and North West European Campaigns. Mk I had a 2 Pounder Gun in the turret and a 3 inch Howitzer in the front of the tank’s hull. Mk II had the 3inch Howitzer replaced by a 7.62mm BESA mg.
Mk IIC had the two gun positions swapped around. Mk IV had a 6 Pounder in a new cast turret. Mk IV (NA) had the American 75mm Dual Purpose Gun in the cast turret. Mk V had a 95mm Howitzer instead of the MK IV’s 6 Pounder. MK VI had a British 75mm dual purpose gun instead of the Mk IV’s 6 Pounder. (The British 75mm Dual Purpose Gun was a bored-out 6 Pounder and could fire the same ammunition as the American 75mm Dual Purpose Gun). MK VII had thicker armour and a new cast/welded turret, heavier suspension, better gearbox and the British 75mm gun. Mk VIII was the same as the Mk VII but had a 95mm Howitzer. Mk XI was an up-armoured and up-dated Mk V.
The A43 Black Prince was, basically, a heavier, wider and slower version of the A22 Churchill. It weighed 49 tons, was 2 feet wider than the Churchill, had a slower top speed of 11mph and was armed with the famous 17 Pounder OQF Anti-Tank Gun. Only 6 prototypes were ever built before the project was cancelled. The Centurion Mk I was found to be a much superior tank and was put into production instead of the Black Prince. Percy Hobart was an officer of the Royal Engineers between 1904 and 1923. In 1923 he joined the newly formed Royal Armoured Corps in the belief that the tank was the future of modern warfare. After the disastrous Dieppe Raid, it was realised that specialist armoured vehicles would be needed for future amphibious landings. So in April 1943, Hobart was given the task of raising, organising and training the 79th Armoured Division for the invasion of Europe in 1944. By the end of October 1943, various Royal Engineer units had been absorbed into this new division and formed the 1st Assault Brigade, Royal Engineers. The main vehicles this Assault Brigade used were based on the Churchill hull and were various versions of the Churchill AVRE (Armoured Vehicle Royal Engineers). armed with a 290mm Petard Spigot Mortar and could carry fascines for filling in ditches. which was a rolled up track way which, when unrolled, allowed other armoured vehicles to cross beaches without getting stuck. 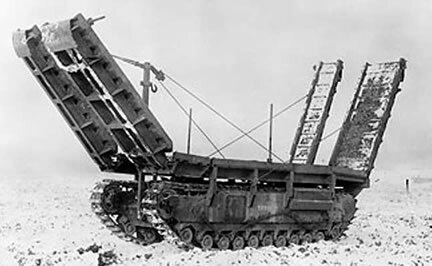 which was a Churchill hull, fitted with a ramp at both ends and, with the ramps lowered, allowed vehicles try drive over the top of it in order to cross larger ditches or obstacles. which had its bow machine gun replaced by a flamethrower. Fuel for the flamethrower was carried in an armoured trailer towed by the Crocodile. There was enough fuel for 80 1 second bursts of fire. 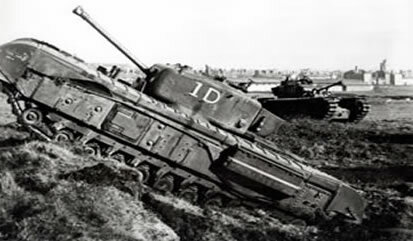 The Churchill Crocodile went on to become one of the Allies’ most feared weapons. 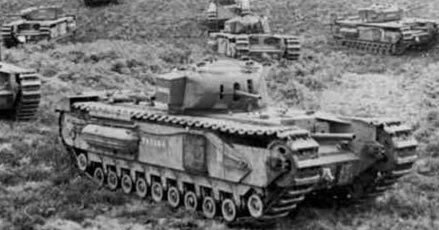 When the Korean War started in 1950, a few Churchill Crocodiles were sent out there, but the crews soon dropped off their armoured fuel trailers and used their Churchills as conventional gun tanks. The Churchill’s excellent cross country mobility, again, enabled them to climb the hilly terrain found in Korea; much like it did during the North African campaign in Tunisia as mentioned earlier. 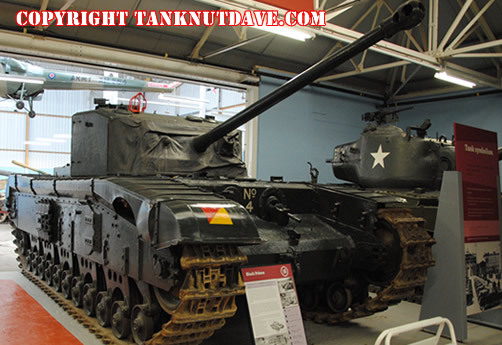 Whilst most of the Churchill adaptations were used by the Royal Engineers, other adaptations, based on the U.S. M4 Sherman Medium tank, were used by the Royal Armoured Corps units. The various vehicles used by 79th Armoured Division proved to be extremely successful, especially during the Normandy landings. This page was writtern and Submitted by Bruce Forrest.